What is the Nelson Broadband Fibre Network? Nelson has many traditional broadband service providers and is a “well-connected community”. One of the broadband enablers available in Nelson for businesses is the City of Nelson’s fibre network. The City of Nelson offers a “dark fibre-optic” network as a utility. The city has a unique advantage of partnering with its Nelson Hydro power business, which owns the poles and conduits, making it possible for Nelson to use these assets to mount and run fibre throughout the community. “Nelson Hydro is a City of Nelson owned and operated utility, and is the local supply authority for electrical service in the City of Nelson and surrounding area.” Visit www.nelson.ca for details. Where is the fibre network available in Nelson? Nelson Fibre is available mostly in Nelson’s business core areas, Railtown and the Mall. There is no fibre optic infrastructure currently available in residential areas outside the existing downtown and schools/college areas and additional fibre construction will be based on market demand. Although we have residential rates, these residential rates primarily apply to residential customers in the existing fibre service area. 1. Complete the Nelson Fibre Application – the application has notes and descriptions for your reference. 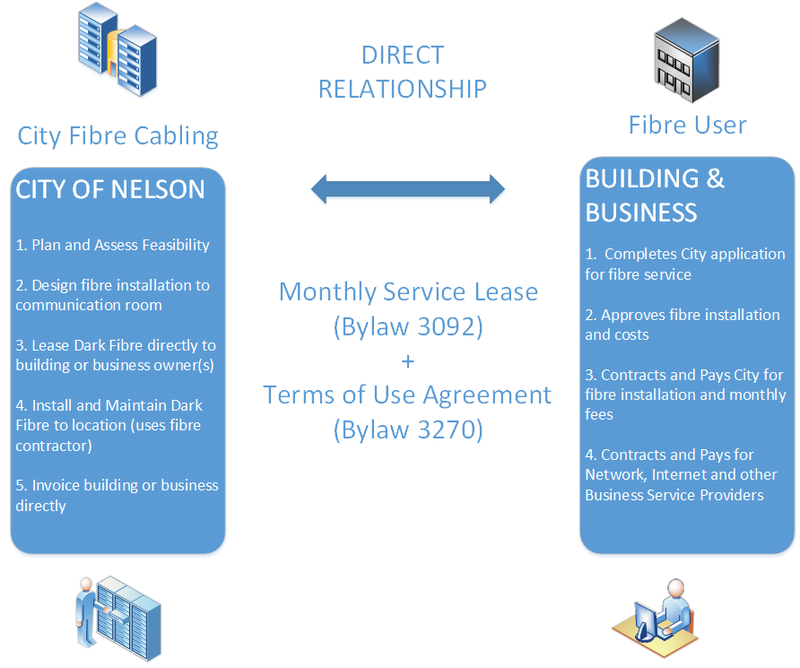 Download and complete the Nelson Fibre Application – Word Version; Nelson Fibre Application – PDF version or email nelsonfibre@nelson.ca to obtain one. “Dark fibre” is fibre optic cable that has not yet been “lit-up” by networking electronics. The dark fibre is provided by The City of Nelson and the Internet plus other services are provided by the Service Providers. The fibre utility fee is much like the basic charge you pay on your electricity and natural gas bills. It is a monthly rate for access to the fibre infrastructure, BUT the monthly fee does not include network, internet and business services. These services are offered by “service providers”. 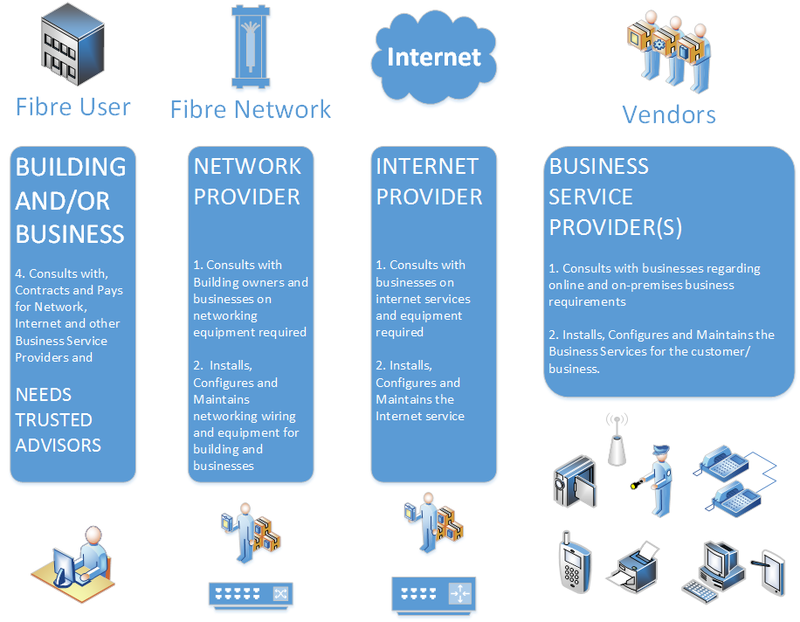 Businesses have a choice of network, internet and business service providers. New fibre rates are available for Multi-tenant buildings, as well as for downtown residents and non-profit organizations. Refer to the Fees Bylaw – Schedule J for fibre lease rates and their descriptions. This multi-unit fibre lease fee can be shared with other tenants in the building. Each tenant then would have their own Internet service, on their own private network. In some cases, tenants in multi-unit buildings still prefer to have their own private fibre strand, so that is still an option. $150 per fibre strand, per business location, per month for 1GB (Download and Upload) + Internet Service Provider fees. NOTE: Internet service fees vary by service provider and packages desired. Check with the Internet providers who may provide the 1GB Internet Service. However, often this 1GB connection is used to interconnect local Nelson offices, so this not always about Internet. Consult with the Internet Service Providers listed below for quotes on their Internet and other services… Ask them for Nelson Fibre Internet rates. The fibre construction to your premises is building specific and Nelson Fibre manages the construction on behalf of the applicant. After a fibre application has been received by Nelson Fibre, we solicit quotes for the fibre construction and present those to the applicant for approval, as the applicant pays for the installation “At Cost”. Refer to the Fees Bylaw – Schedule J. What is your Business’s relationship with the City of Nelson? Who are the “Add-On” service providers and what is their relationship with your business? Contact information and details about add-on services are provided below or contact your existing service provider for information about available services.